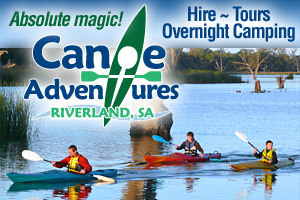 The Murray River has some of the best kayaking and canoeing experiences in the world. We're not talking about rapids but imagine the peace and serenity as you silently glide and discover the backwaters, creeks and lagoons on one of the many dedicated kayak and canoe trails along the Murray River. There is so much of the river to explore with its bio-diversity and abundant riverbanks that sustain so much life. You'll encounter incredible wildlife including kangaroos, emus, koalas, goannas and much more. The river also has an incredible diversity of birdlife that enjoy the lush river surroundings. If you're not up to your own kayak or canoe experience, you can take a guided tour where all the equipment is supplied and you'll be led by a qualified guide with canoeing experience but we recommend using a local operator who has local knowledge. There are many places along the Murray river where you can hire kayaks and canoes to explore the waterways at your own pace. When planning a canoeing or kayak river experience it is important that you always ensure your personal safety. 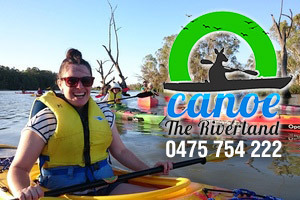 So for the ultimate Murray River experience, that is friendly on our precious river environment consider exploring the Murray by canoe or kayak, it will give you the best sense of this beautiful river system. Gunbower Island, near Cohuna, lies on the floodplain between the Murray and Gunbower Creek. It has a water frontage of 130 kilometres with 20,000ha of state forest covering about 80 percent of the island. Until damming, the red gum and box forests were flooded every year and today still depend on the occasional inundation. The forests and wetlands draw fisherman, canoeists, campers and walkers. The great varieties of waterbirds are a feature. There are camping and picnic spots along the length of the Murray and Gunbower Creek. The island has a circuit walk that takes 7-8 hours. There are numerous tracks to the island from the Murray Valley Highway. Access through Cohuna (where there is a caravan park and motels), Gunbower or Koondrook. For paddlers with appropriate equipment and a basic skill level the Katarapko region is an interesting and safe area to explore. Never the less, in addition to the planning considerations outlined in the Canoe Guide, there are some other important issues to consider as the area is quite isolated. A map and basic mapreading skills are necessary when embarking on an extended trip into the area. It is also important to check the weather forecast. The Eckert Creek Section has become narrowed by the growth of reeds due to the limited river flows and levels. As such it can be difficult to pass through this section without extensive portaging (exiting the craft and pushing / dragging through reeds). Allow extra time for trips in this sections as a simple passage may not be possible. The main Katarapko Creek is usually clear from obstructions, however there are a significant number of submerged and semi-submerged logs / trees in the creek that can prove hazardous to the novice. Take care to keep a good look out for obstacles just below the surface as the ones you cant see are the ones that might tip you in! The water can be extremely cold in the cooler months so a capsize may be unpleasant! In the summer, day time temperatures can be over 40ËšC and so adequate precautions need to be taken on those days, such as staying in the shade and minimising physical exertion during the heat of the day, drinking adequate quantities of water and wearing appropriate sun protection. Fun and history with minimal impact on our Murray River. The Murraylands Regional Tourism Association Inc. have compiled this great way to explore the Murray River around Mannum by canoe. The trail is a comfortable paddle past beautiful Mannum waterfront properties and the Mannum Museum and PS Marion. It also includes two exposed wrecks. Click here to download a PDF (1.3mb) Haven't got a canoe - not a problem. You can hire one locally (Breeze Hire 0438 802 668 or SA Ski Boat Centre). If you would like to view these wrecks by boat Helen and Jeff from Jester Cruises leave from the Mary Ann Reserve 2.15pm each day except Saturday. Their afternoon tea cruise is a great way to learn more about the wreck's history. Contact Jester Cruises on 0419 909 116 or visit their website. More than 15km in length, Lake Mulwala is a haven for birds such as pelican and ibis and native fish and is used all year for a variety of water sports. Work on the lake began in the 1930s with the damming of the Murray River at the Yarrawonga Weir as part of the Murray-Darling Irrigation Scheme. The eastern end of the lake offers shelter among the dead trees while the western end has a large expanse for sailing and boating. Murray cod, trout and yellow belly seem to thrive in the lake. Enjoy picnicking, bird watching, fishing, boating, sailboarding, water-skiing, swimming, canoeing, sailing, and paddle boat cruises. Access is from the Murray Valley Highway, Yarrawonga-Benalla Road or Yarrawonga-Wangaratta Road. Just off the Calder Highway 70 kilometres south of Mildura, Hattah-Kulkyne features mallee and woodland country, magnificent River Red gums, and a lake system seasonally filled by creeks connected to the Murray River. The tranquil waters of the extensive lakes system fed by Chalka Creek contrast with the mallee scrub and cypress pine woodland, one of only 3 Biosphere Reserves in Victoria. Camping, walking, bike riding, driving and canoeing are popular activities. Two basic campgrounds are located in the National Park at Lake Hattah and Lake Mournpall, whilst there are many riverside bush camps in Murray-Kulkyne Park where generators and dogs on leads are permitted. Fishing licences and supplies are available at the nearby Hattah store. 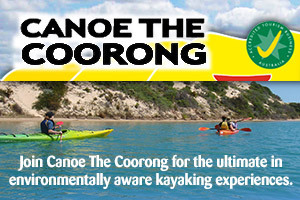 Canoe the Coorong offers tours for people of all ages and skill levels from a short two hour kayak with the New Zealand Fur Seals, Full day all inclusive The Coorong Tour, Overnight Camps and for a real adventure a Four Day Expedition covering almost 100km. or hire your own houseboat to explore the Murray.